Sometimes you just feel like baking cookies. They are such a universal treat. While the all-American chocolate chip cookie always excites, it is fun to think of other favorite cookies and their origins. I love coiled Greek koulourakia around Easter, Italian biscotti with my morning coffee or an Argentinian alfajor whenever I can find it in the States. 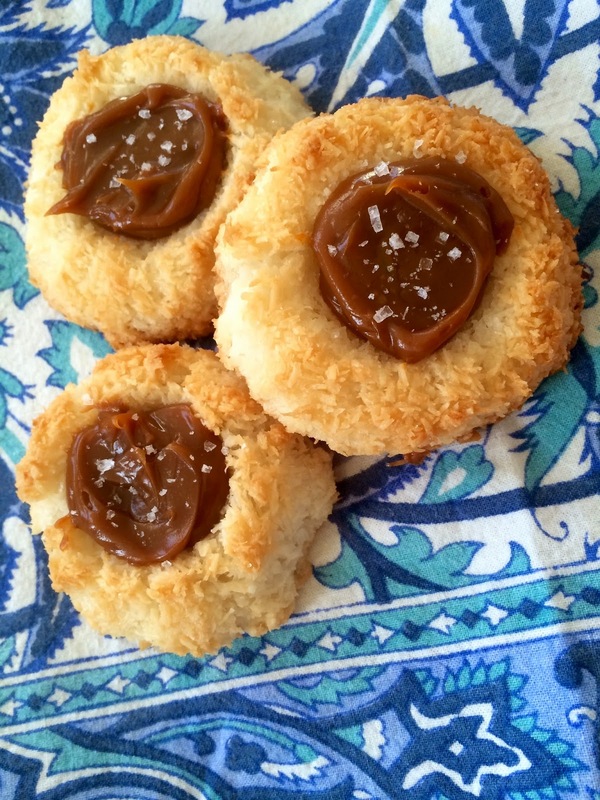 I remember my instant attraction to the soft buttery cookies sandwiched around creamy dulce de leche while on a trip to Buenos Aires a few years back. 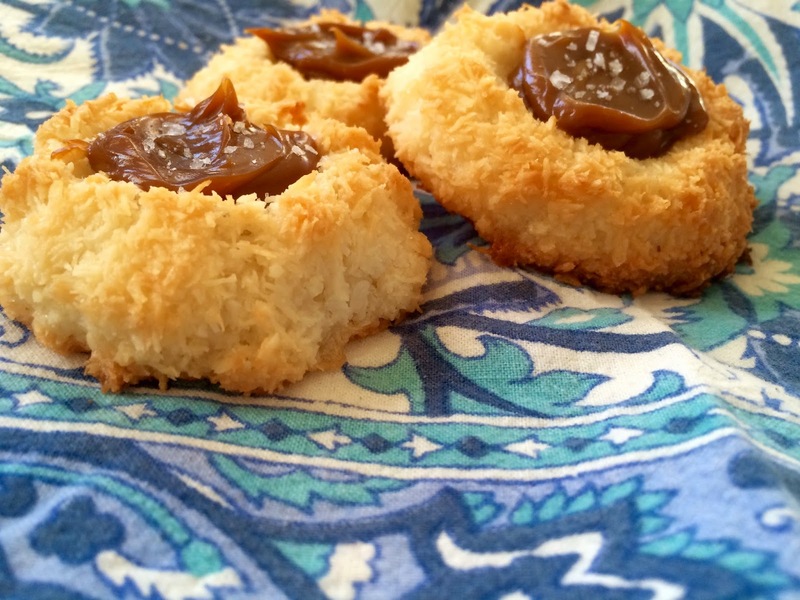 If Kara had to choose her favorite, the coconut lover would most likely think back to her time in Paris where she tried her first coconut macaroon. Yearning for that freshly-baked cookie smell in my apartment, I decided to create a cookie merging Kara's and my favorite kinds. I made a light macaroon base with a decadent spoonful of thick and sticky dulce de leche in the center. Dulce de leche is a delightfully thick caramel spread made from cooking down milk and sugar. Many people make their own dulce de leche by slowly boiling a can of sweetened condensed milk. In this instance, I popped into my favorite artisan grocery, Formaggio Kitchen for a jar of La Salamandra. The super sweet bites with a salty kick sprinkled on top were a lovely balance of flavors and textures. I was excited to see share them with Kara. Line a baking sheet with parchment paper. In a large bowl, beat the egg whites for 2 minutes until frothy. Add the sugar, coconut, vanilla, salt and beat for 2 more minutes until combined. Spoon tablespoons of the batter into dampened hands and form into a tight ball. Place the ball on the prepared baking sheet. Repeat with the remaining dough, placing the mounds about 2-inches apart. With the back of a teaspoon, gently press down the mounds to create a thumbprint in the middle. Use your fingers to form perfect rounds, if need be. Place the pan in the oven and bake until golden brown, 15 to 20 minutes. Remove the baking sheet and transfer the macaroon thumbprints to a wire rack to cool completely. Spoon the dulce de leche into a plastic freezer bag. With scissors, snip a small hole in the corner of the bag and squeeze the dulce de leche towards it. 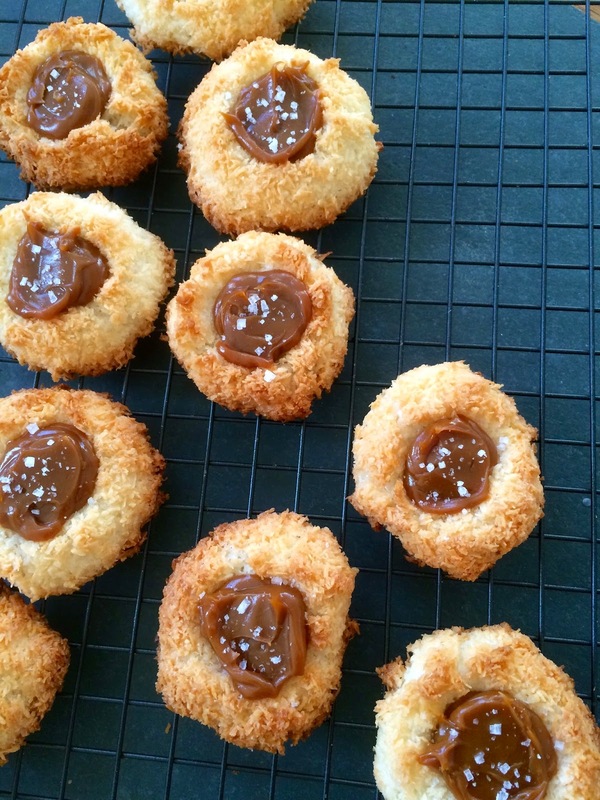 In a spiral motion, squeeze the dulce de leche into each macaroon’s thumbprint indentation. Wet a knife to smooth tops, if need be. Sprinkle each macaroon with the sea salt and enjoy. Makes 20-22 cookies. These cookies also keep for over a week if sealed in the fridge!